Stop-Traffic.com is owned and managed by Reflective Inc. – Experts in Reflective Safety Tape and in Business for over 22 years. The articles on this site are written by Steven Cole. 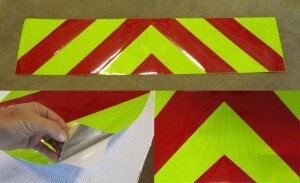 Reflective Pre-Striped Tapes are used to alert, divert or stop traffic. Barricade tape is often used at the end of dead end roads or at the end of a washed out road. You will also see it used on barricades that mark hazardous areas. Reflective gate arm tape is used to mark railroad and other gate arms. 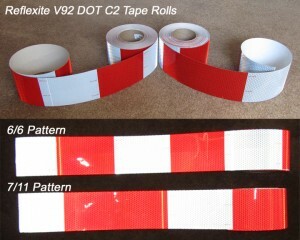 Striped DOT tape is used to mark tractor trailer rigs. Although these tapes a made for specific purposes, customers use them in thousands of application where night time visibility is important. 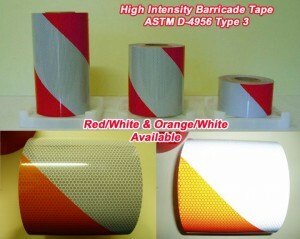 For example, you will see DOT tape made for trucks used on trailers or containers. You often see barricade tape used in the same way. Many people use the tapes for bollards or fences. The applications are almost endless. Our company carries a full line of striped reflective tapes. You will find articles to the left that describe the different tapes we carry and provide a link to one of our online stores that carry that tape. We also have quick links to each product below. We normally ship the day a product is ordered and are knowledgeable about everything we sell. Our main site can be found here. Reflective Gate Arm Tape – for Railroad Crossings and other Gate Arms. 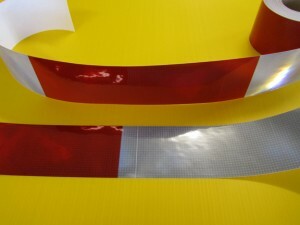 DOT Reflective Truck Tape – for semi trucks.